We are still recovering from what was an amazing 30th anniversary celebration for the choir. So much hard work and preparation went into commemorating our last three decades with our exhibition, flash-mobbing and performing our special commission from Richard Thomas, our festival day Hand in Hand featuring over 20 LGBT choirs from around the country. We definitely earned our summer break this year. That said, we’re already looking to a fabulous fourth decade of song. 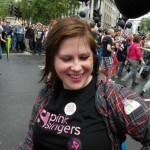 The Pink Singers are looking for new members for our next season starting later this month. If you love singing and want to be part of a fun, friendly and vibrant LGBT community then why not come along for a taster? On Sunday September 22nd we’re opening our rehearsals and inviting you to come and get a feel of what it’s like to be a Pinkie. If you like what you see (or hear) then you can come back and try out. For more information, please see the Join us’ page of our website and drop me an email at joining@pinksingers.co.uk. I’ll send you all the details to get you started. We already have loads planned in the run up to our next London concert in January 2014. So why not Sign up to our mailing list (right), like us on Facebook or follow us on Twitter to keep in touch and see what we’re up to. Next Next post: Y Cantorion Pinc yn mynd i Gymru!